Where have I been? What have I been doing? Not much, but to give you an indication of the state of my mind lately, here is a picture I took of my feet yesterday. I noticed them only after I had taken Gus to school, chatted with his teacher, chatted with some friends, poked around Kmart [oh how I love me some Kmart], and then helped customers at the store for a couple of hours. At least your pedicure looks good! Your picture made me laugh out loud, silently!!!! It seems like it could be a real style statement. Yes, ladies, perhaps I've started a new fashion wave! 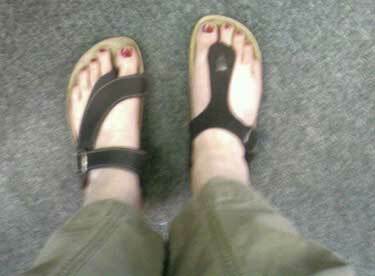 I decided to wear matching shoes today, though.